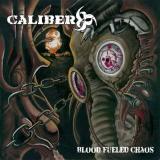 Caliber 666 seems like an appropriate enough name for a death metal band to me, especially one that sticks to the old-school themes of violence, horror, and of course death. These guys are a relatively unknown newer band that is trying to revive the corpse of old-school death metal, clearly influenced by those such as Morbid Angel and Kataklysm. However, while their influences and intentions are good, Caliber 666 runs into trouble on this album from what is simply a lack of originality and a sound that does not make me want to turn on their album instead of one from the aforementioned bands. Right from the start of the first track To The Killing Fields you can tell this is going to be a violent, gore-based album. The guitars are of course very heavy, but the production definitely seems to center too much on the lower end. The guitars have plenty of crunch, but the drums get muddy in the mix. As the song goes on I notice that the vocals do as well. Vocalist Joakim Mikiver has a pretty typical death metal growl, but it is strong and even with the sub-par production, it comes out sounding decent. The first song incorporates some groovy guitar riffs towards the middle, as well as some cleaner guitar mixed with the heavy riffs. Overall not a bad start, though I'm concerned that this is simply going to be a rehash of what older bands have already done. Black Smoke is pretty typical; heavy, chugging riffs backed by big drums and growls.It does have speed on its side however, and I can definitely see this being popular in the mosh pit. A Part Of The Art starts out foreboding and dark with slow, droning riffs layered over some dissonant notes. The pace picks up a little when the vocals come in, and reminds me of old-school early 90s death metal in some ways. The riffs aren't too simplistic here, though they can tend to blend in with the vocals too much at some points. Frontline also gets interesting with some more complex guitar work, and the shorter length of the song fits. Many of these songs simply go on too long after the opening riffs have been played out. Serpents Walk similarly tries to get a more interesting lead going, and continues to change things up throughout the song, mostly in the form of different guitar riffs. This is the kind of creativity that needs to be taking place on the entire album. Overall this album is not bad, but it lacks anything really good to set it apart from others in the genre. It's decently executed death metal, but its been done better for over 20 years. Anyone who buys this album is probably just going to want to put on Morbid Angel or some other classic old-school death metal, because those bands mastered the art of creating interesting death metal of this style. I respect what these guys are doing, but if they expect people to really want to buy their albums and support them, they have to come up with some kind of appreciable difference to past acts.